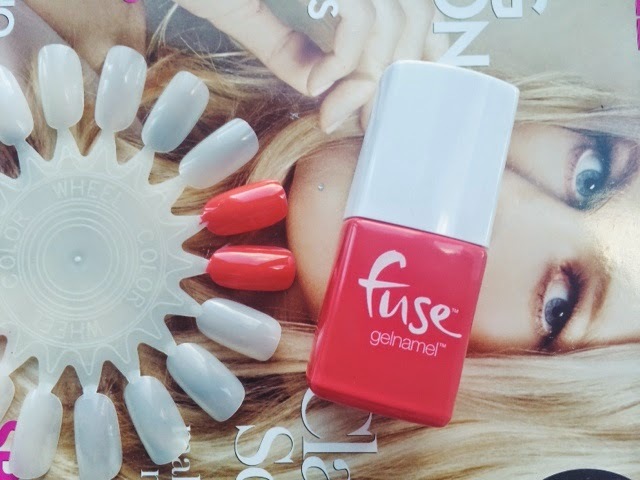 Fuse gelnamel is a new range by sensationail, this is a gel nail polish but this must be used with the UV light, you can buy the UV light in a starter kit which includes the light and one polish this is avaliable from boots and is £35. There are 12 different colours to chose from, the one I have above is the Elec-tric or treat, I think this colour is perfect for the spring and summer it's the perfect coral colour! I applied two coats to this but it is fine with just one! This is very easy to apply it does seem quite thick but that's probably because it's a gel consistency once applied it dries very quickly using the UV light and gives a glossy finish. I haven't had it on for very long so I can't really comment if it lasts very long but I will definitely do an update! So far I love this the UV light does seem expensive but in the long run is worth it and I think the for £15 a bottle it's very reasonable co code ring this is gel nails. But so far I would defiantly recommend this anyone. Ill do an update soon! 2 comments on "Fuse Gel Nail"